At this time of year Japanese knotweed Fallopia japonica is growing very quickly – 20cm a day. The top 20cm is the most tender and flavoursome so it’s best to catch it early, before it gets woody. It can still be used at a later stage but you have to peel it. 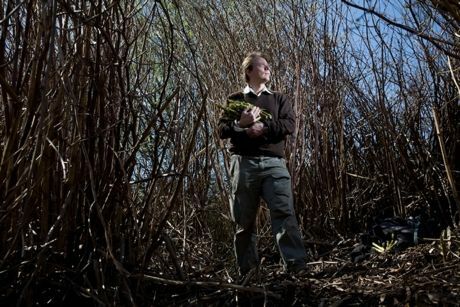 Knotweed can be found along riverbanks, waste grounds and, frankly, anywhere it chooses. To remove it organically you would have to dig 5m down and burn all the soil. The area I forage for it is huge,about half the size of a football field. It was most likely spread from builders’ waste, as is often the case. Before you know it, a 6ft maze makes it impossible for all around to grow, like a supermarket moving into a small town. Knotweed is a controlled substance, so take care when transporting cuttings, and be sure to burn any leftovers to avoid breaking the law. Knotweed Vodka Ingredients 450g knotweed 750ml vodka 225g sugar Gather knotweed shoots and chop into 3cm pieces, then put into a 1 litre jar. Add the sugar and vodka and seal. Shake well and leave for at least 3 – 4 weeks. Strain back into bottle through muslin/cheesecloth and place in a cool dark place for 3 months. The discarded knotweed can be eaten and, as it tastes remarkably like rhubarb, works well in a crumble – simply follow the recipe for a rhubarb crumble replacing knotweed for rhubarb, weight for weight. I tried it with some knotweed that was probably past prime (the leaves were fully opened, some of the stems slightly woody). I liked the taste, but I thought it was waaay too sweet. The knotweed I used was only mildly sour, so that might have been a factor. As this was my first experiment with knotweed, I don’t know what it would have tasted like if I had harvested earlier. With tonic water to offset the sweetness it was quite tasty. Anyway, thinks for sharing this recipe! Each to their own James, some of us have a sweet tooth! Thanks for posting.